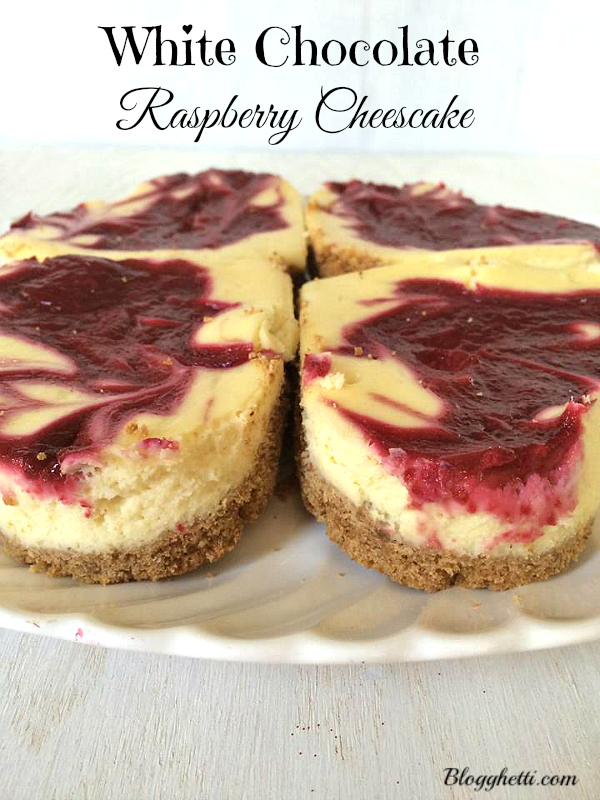 This easy White Chocolate Raspberry Cheesecake is perfect for the loves of your life! The white chocolate gives the cheesecake just a tad more richness, while the raspberry adds a bit of tart with sweet to the whole wonderful dessert. This is so easy that anyone can do it! 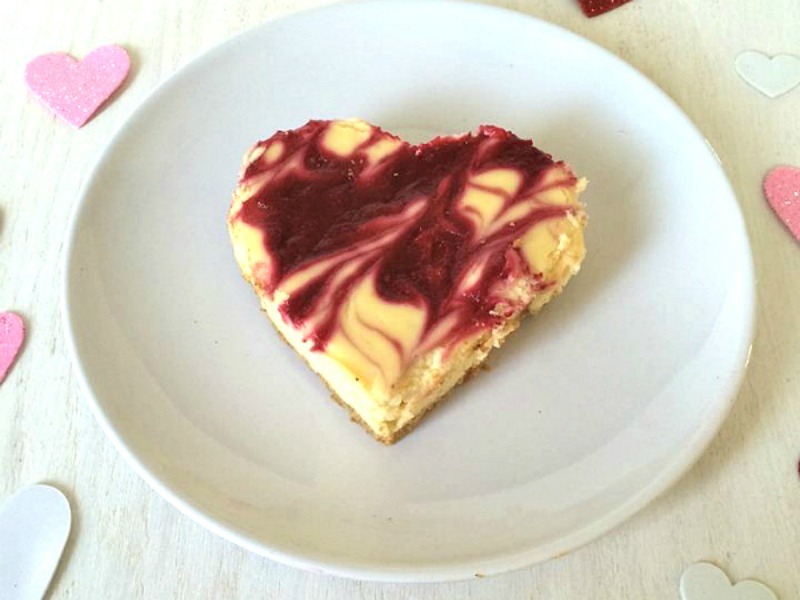 I’ve made these delicious White Chocolate Raspberry Cheesecake Hearts quite a few times for my husband on Valentine’s Day, and he loves them. I’ve even used Oreo cookies as the crust to change things up with the graham crackers. Can’t go wrong with that, or changing up the fruits too. The hardest part of this recipe is going to be making sure your White Chocolate is cool enough before you add it to your cheesecake mixture. If it’s not cool enough, it will harden and your cheesecake will be lumpy. That really isn’t hard either, so you can see how simple this recipe is to make. If you don’t have a large enough heart shaped cookie cutter, you can freehand the hearts to cut out. 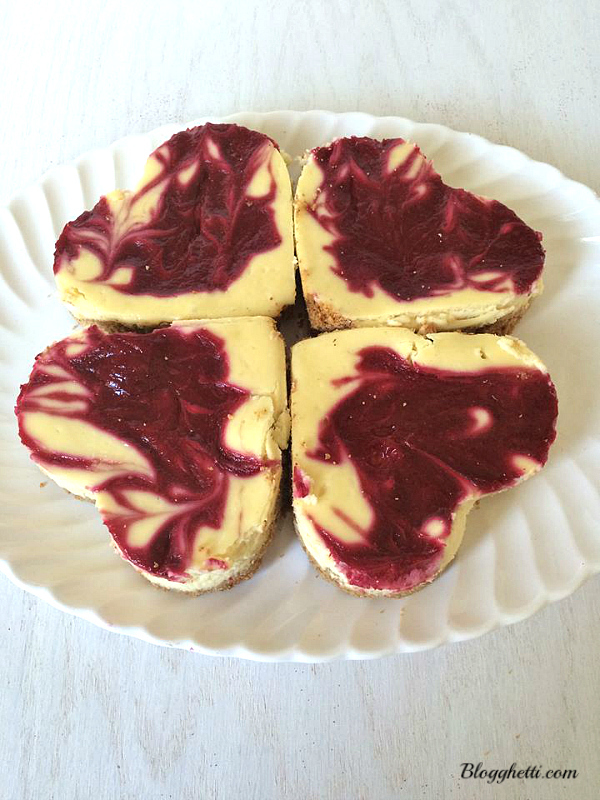 To be honest, I’d love to eat these little cheesecakes in any shape they may be in. In a medium bowl combine the graham cracker crumbs with the melted butter and mix until crumbs are evenly moistened. Pour crumbs into a 9-inch square baking pan, and use your fingers to press into an even layer over bottom and about ½ inch up sides of pan. Bake for 8 minutes, until firm. Do not over bake. Transfer to a wire rack and let cool completely. Combine raspberries and 1 tbsp. sugar in a food processor and blend until smooth. Strain through a fine-mesh sieve into a bowl; discarding the solid parts. Using an electric mixer at medium speed, beat cream cheese and remaining ¼ cup plus 1 tbsp. sugar until smooth. Add eggs and yolks one at a time, beating briefly after each addition. Add flour and vanilla and mix just until combined. Fold in white chocolate. **Be sure the white chocolate is cool or you'll have lumps in your cheesecake as the chocolate will harden. Pour cheesecake mixture over cooled crust, spreading evenly. Drop spoonfuls of raspberry puree on top and using a toothpick, drag raspberry puree through cheesecake to create a marbled effect. Be careful to not drag into crust. Bake until edges are pale golden and cheesecake is just set in center, 1 hour and 15 to 20 minutes. Let cool completely on a wire rack, then cover and refrigerate until fully chilled, at least 2 hours. Cut with a heart cookie cutter or cut into bars and serve. ** I found it was easier to cut the cheesecake out if the cookie cutter was chilled in the freezer for about 30 minutes.